The sun is one of the most prominent elements that can do lasting damage to the skin. But this doesn’t have to mean you will be stuck indoors during great weather! Instead, it simply means that you should take precautions to protect your skin from the damaging rays of the sun. The following are a variety of ways that you can provide your skin with the ultimate sun protection. You don’t have to stay out of the sun completely, but avoiding the time of day when the sun is at its strongest is a great way to limit sun exposure. By timing your outings accordingly, you will be able to avoid the most harmful rays of the sun and protect your skin from the damage sun exposure can do. There are a variety of types of clothing that can help you provide your skin with the ultimate in sun protection, including wearing long sleeves instead of short sleeves, pants instead of shorts, and hats to shield your face and scalp. By wearing the proper clothing, you can limit your skin’s sun exposure while still enjoying time outdoors. 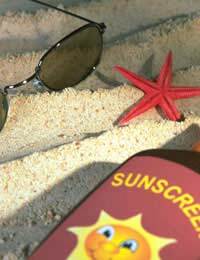 It is important, however, to be sure to wear sun block on any areas that are still exposed. When choosing proper protective clothing, you should also be sure to include your eyes and wear sunshades that offer protection from both UVA and UVB rays. Don’t forget that dark colors attract sunlight when picking your attire for your day out in the sun! By sticking with white or light-colored clothes, you won’t get as hot while protecting your skin. It is also important to keep in mind that different types of fabrics offer different levels of protection. Thicker, less breathable materials, offer more protection than breathable cotton. And, if a cotton article of clothing gets wet, it offers very little protection from the sun, and you should use other means of protection to prevent sunburns. Waterproof is best, but not completely guaranteed - Even though you are wearing waterproof sun block, it can still partially wash off. Be sure to wait at least 30 minutes after application before heading into the pool to be sure that your skin has absorbed the cream. Then, as soon as you exit the water, reapply the sun block to ensure that its protection is continued. Don’t wait until you are already in the sun - For sun block to work to its fullest potential, it needs to be absorbed into the skin, so it is best to apply the lotion before ever stepping outside. If you wait 30 minutes after application to venture in the sunlight, your sun block will be working from the very beginning of exposure. Don’t forget to reapply - No matter what SPF your sunscreen is, you will need to reapply it every hour or so that you are out in the sun. This is true whether it is water resilient or not. Complete coverage is necessary - Applying an even coat without missing any spots is vital in achieving maximum protection from the sun. One of the best ways to ensure that your sunscreen is being thoroughly applied is to use a thick brand so you can actually see it on your skin as it is applied. For children, complete coverage can easily be achieved by using one of the brands of colored sun block. These not only make the application process more fun, but you can see exactly which areas have been covered and which haven’t, ensuring complete sun protection. Remember that you don’t have to actually see the sun for its rays to damage your skin - Any time you are outside for long periods, even on cloudy cold days, you should wear sun block. Even if you don’t feel like you are getting burned, and the sky is full of clouds, the harmful ultraviolet rays produced by the sun can still reach and harm your skin, so wear sunscreen with an SPF of 15 or higher to achieve maximum protection. If you don’t have protective clothing, or if it is simply too hot to wear long sleeves and pants, you can avoid damaging sunlight by spending some of your outdoor time in the shade. If no shade is available, you can take an outdoor umbrella with you to provide you with the protection your skin needs. It is also important to remember, especially if you can’t find any shade and don’t have an umbrella, that sand, water and snow all reflect the sunlight and intensify its harmful rays. By following the methods above for sun protection, you will be able to enjoy your days in the sun without suffering from painful sunburns or other damaging effects.